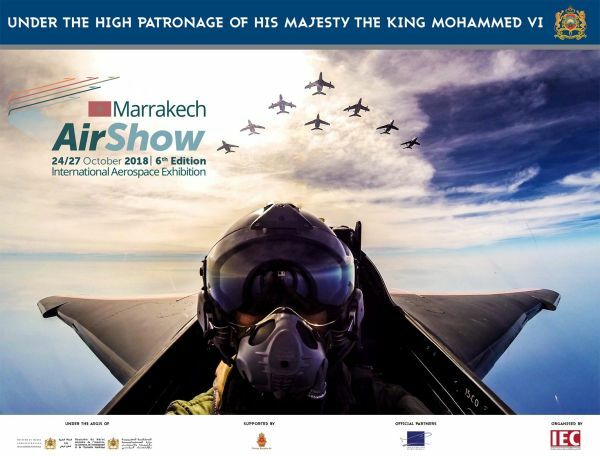 We are pleased to announce the 6th edition of the "MARRAKECH AIRSHOW" Aerospace Exhibition, taking place from 24th to 27th October 2018 at the Royal Air Force military base in Marrakech under the High Patronage of His Majesty King Mohammed VI, under the aegis of the National Defense Administration and with the unfailing support of the Royal Air Forces. In the 5th edition, Marrakech Air show has established itself as the meeting place of the world's civil and military aviation industry for the African continent. The show has acquired its nobility during the last editions. The entire international community and many official delegations of the highest level made the trip, including Russian, Chinese, North American and European, acclaimed the concept of the African Aerospace Platform (AAP) underpinned by the show. In recent years the entire international aviation community has shown an increased interest in Africa. African continent’s states concerned with their economic development are aware of the need for the development of their communication’s means. Air transport and satellite transmissions have become unavoidable vectors of growth in the global "radius of action"
With the "Co Localization" movement of the world aerospace industry, Morocco has been experiencing an exponential growth in this sector since these 10 years, mainly due to the "low cost" production strategy of the major aircraft manufacturers. Morocco has successfully positioned itself as a strategic maintenance platform for the African continent by increasing the quality of its services. In the framework of the trans-African cooperation, Morocco, animated by a firm willpower to develop its relations with the African states, invites about fifty official delegations on this major event. Coupled with Marrakech Air Show 2018, a symposium on Security and Defense with the African Air Force Chiefs of Staff will be organized by the US Air Force Command in Europe and Africa with the support of Royal Air Forces, 22nd and 23rd of October 2018. More than a hundred Heads of Defense and high-ranking air force personnel from the African countries will take part in this annual conference, organized around the reflection on regional and national security problems, the development of bilateral exchanges and the promotion of multilateral cooperation. During this annual conference, the African delegations will participate in round tables during which they will have specific exchanges and will examine aspects related to the training of skills and the technological and logistical strengthening of the air forces of their respective countries. Marrakech Air Show 2018 is THE opportunity for political makers and aeronautics operators to share their short, medium and long-term vision of the AAP’s development, favorable to international industrialists concerned to establish a bridgehead in Morocco in the conquest of African markets.